With the help of the co-founder of ARP Instruments, David Friend, Korg have brought this legendary synth back to life now in module form and added some new and improved features. Over time, there were 3 revisions of the ARP Odyssey that utilised 3 different filter types. The 2015 Korg ARP Odyssey Duophonic Synthesizer allows you to access all 3 of these filter types at the flick of a switch, with only the exterior reflecting the look of its original revision. The 12dB/Oct filter of the first model, the 24dB/Oct of the second and the Type III filter of the 3rd model all help to create vastly different sounds that you can change to your liking. The original 3 models of the ARP Odyssey had used different methods of connectivity. 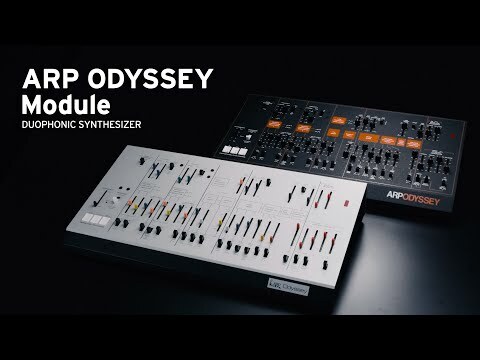 The 2016 ARP Odyssey Duophonic Synthesizer Module has added a modern suite of connectivity options including MIDI in, USB-MIDI, a 1/4" headphone jack and an XLR balanced out so that you can send a crystal clear signal through to any desk or PA system for superior live performances. For the synth enthusiast that wants to own a piece of serious musical history, or for the producer that wants genuine retro sound for their next production, the Korg ARP Odyssey Duophonic Synthesizer Module would make an exceptionally good purchase.